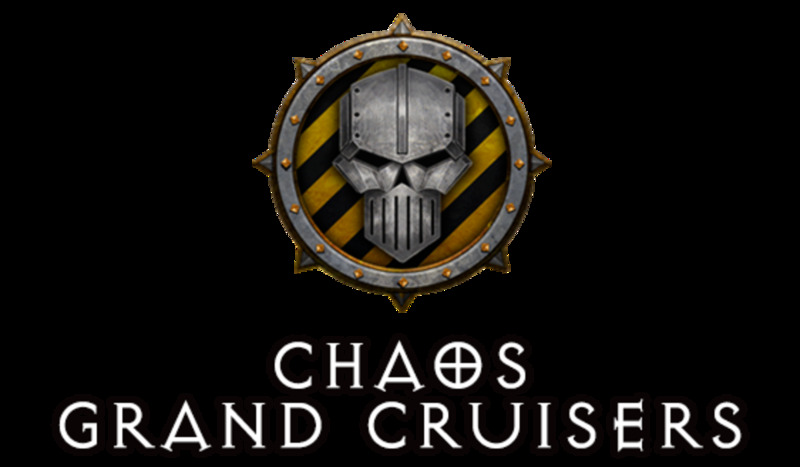 The Chaos have a decent selection of Line ships all the way through, with the most choices being in the Cruiser category, with 4 vessels to choose between. 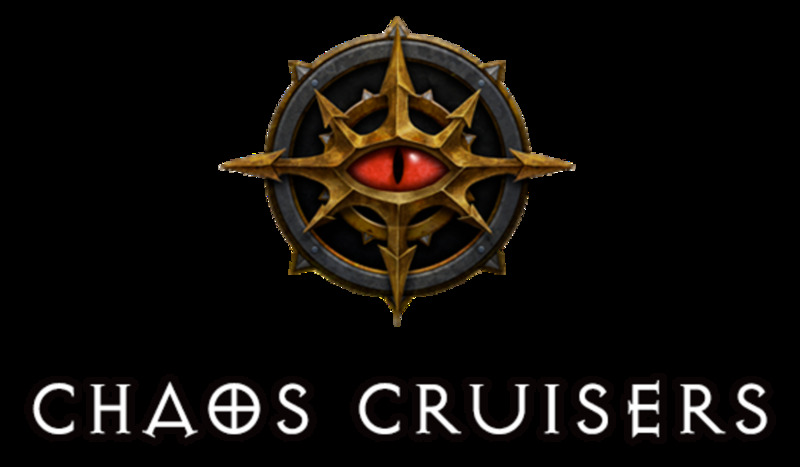 Within the Cruisers of Chaos you will find a mix of lances macros and launch bays, having options ranging between a lance based carrier, a 50/50 lance macro mix dps factory and a couple all/mostly macro options. 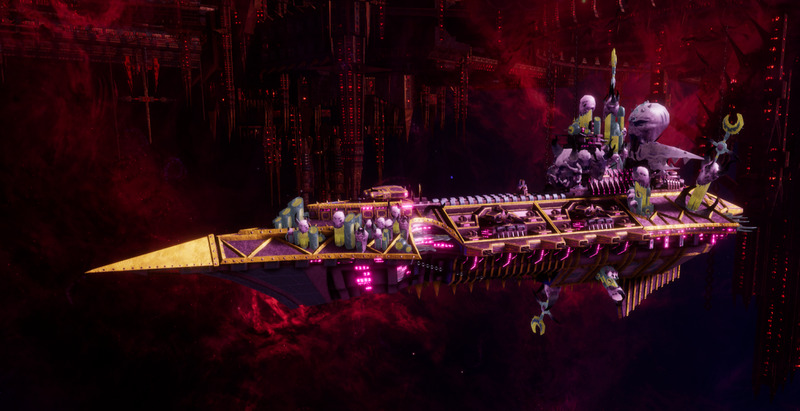 Still continuing the theme of the snipers, the lightly armored Chaos ships typically come with extended range weapons that can deal serious damage to enemies way outside of their identification range, even when they bring spotters. 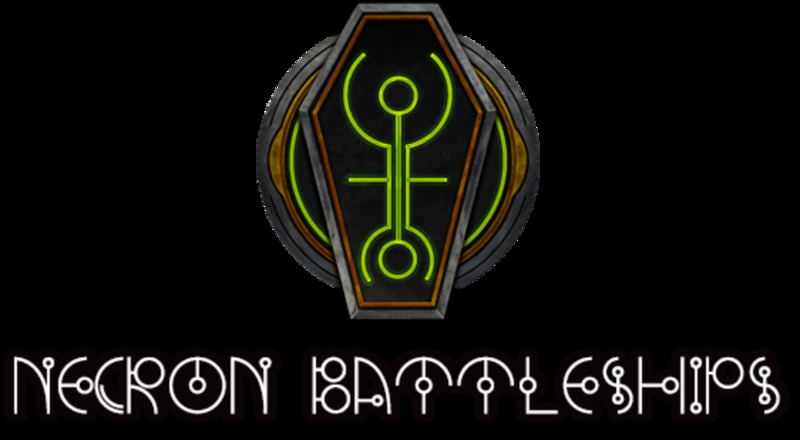 Being one of the original main factions in the game, the Chaos were meant as a sort of counter baseline to what the Imperials offer, in that the Chaos stats don't get crazy but as mentioned elsewhere, are tweaked for faster engines, weaker armor and longer ranged damage. Beyond that most of the stats are pretty standard. 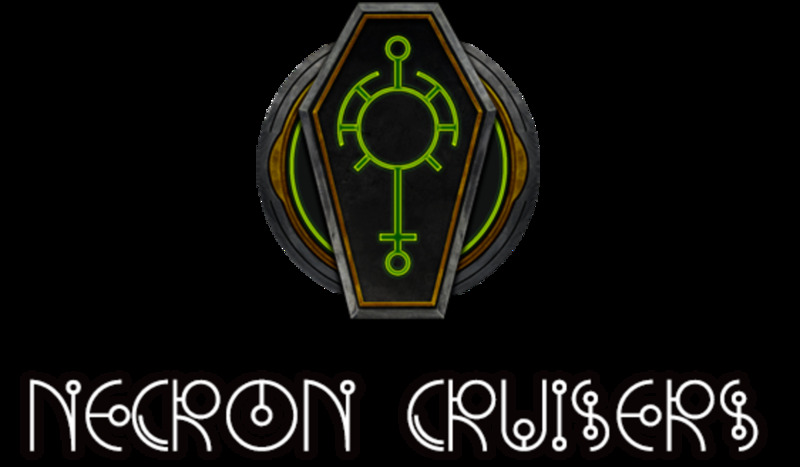 It's worth mentioning that the cruisers actually have decent boarding capabilities. You still want to stay out of boarding range if you can help it, but when you cant stop the enemy from rushing you, you might as well send some troops over to say hi. Nothing too interesting to manage here. 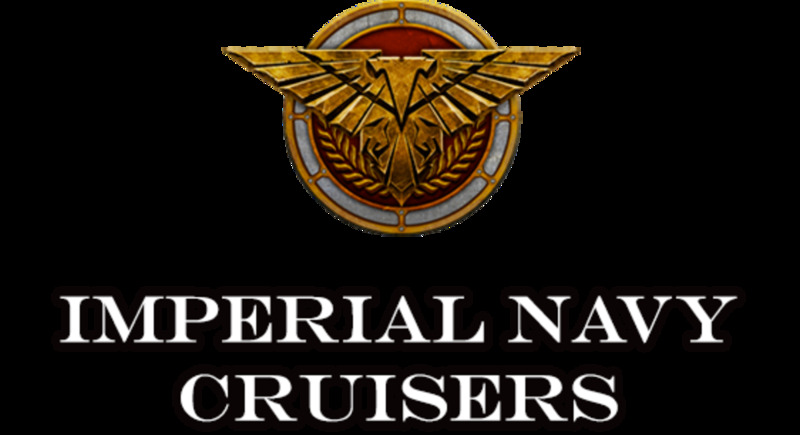 The Cruisers do get an additional +1 troop damage to their bonus chance roll, but 10% is pretty low to begin with so it's not a big improvement. The base damage stats are more significant. 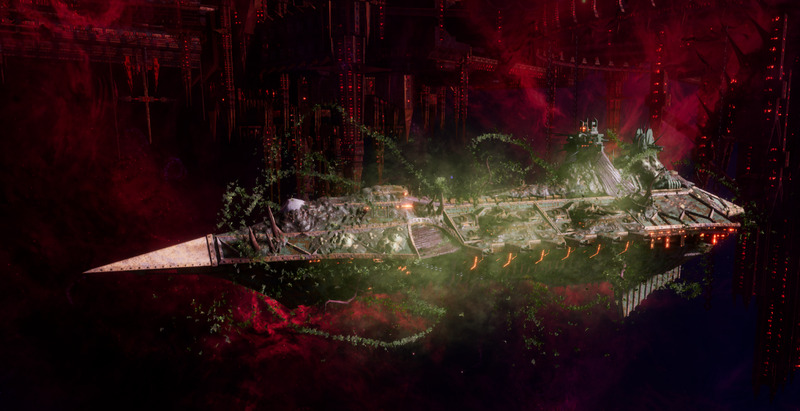 The Slaughter takes a glass cannon approach for the Cruiser group of ships in the Chaos armada. 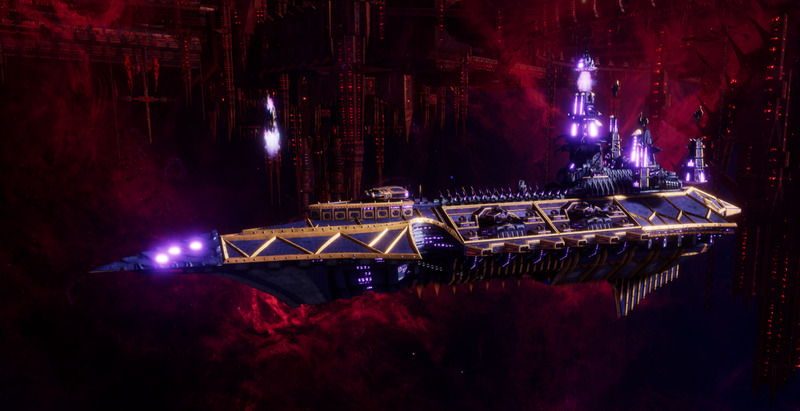 While it doesn't lose any of the pretty decent base stats it comes with, the fact that it's weapons are short range compared to other Chaos ships of both its size and smaller and it doesn't get any extra armor or defensive stats to compensate for the fact it has to operate in a range that is not preferable for its faction. 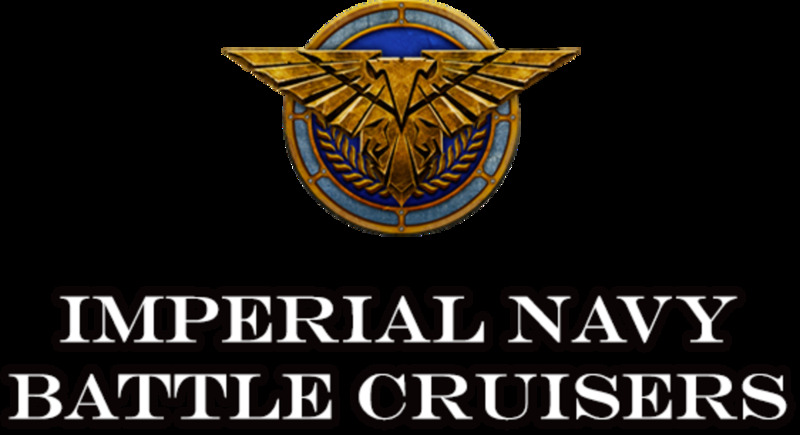 What does help is its faster than normal engines, at 240 whereas the rest of the Chaos Cruisers travel at 200 units. The in-game stats are not good about making this clear, but merged macro batteries are actual Macros and Lances together in the same weapons bay. 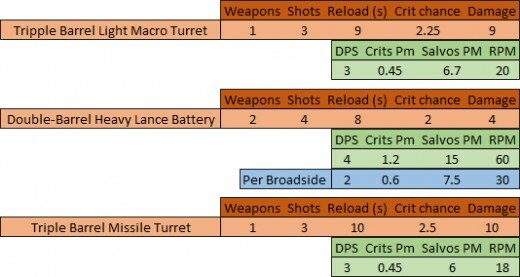 Now this is interesting because the weapon stats make no mention of this and there is no mention of the 100% accuracy or armor piercing, but using them in-game seems to show the 100% accuracy bonus does apply to the lances, however it is difficult to tell if it pierces armor, I would expect it does. As far as I can tell Its impossible to currently tell how much damage and crit chance of the bay is coming from the lances and how the damage dealt is divided up between the macros and lances. If anyone has any further info on this, your comments would be greatly appreciated. 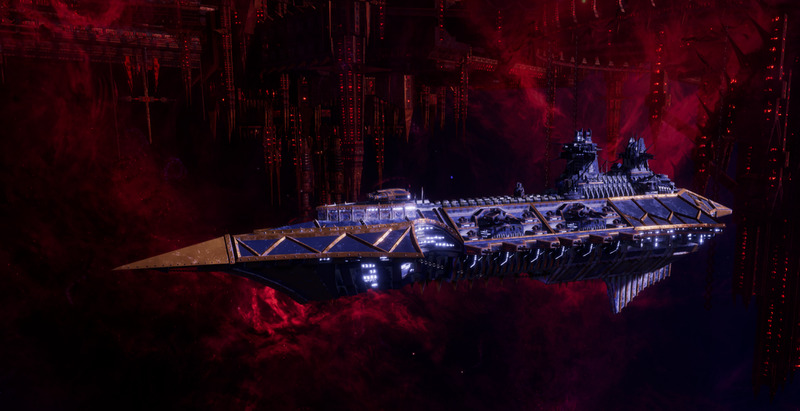 The Carnage grabs the spot for highest raw dps and crit output in the Cruiser class of ships for the Chaos armada. Since it uses entirely macro based weapons, you might want to consider lock on orders for accuracy and crit and keeping in mind that if you try to bring a Carnage to a fight with a heavily armored enemy you can't flank, you are going to take a sever hit to your actual applied damage, especially if you try to stay at long ranges. Most of the Cruisers, along with the Carnage, keep one or a pair of these strong macro turrets fitted atop the hulls, providing a nice chunk of dps in a 270 degree wide arc. 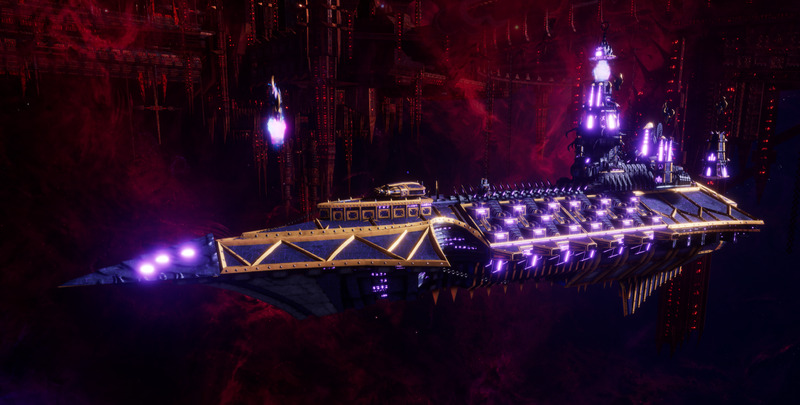 This is something the Chaos definitely have an upper hand on over the Imperium, since they don't get wide-front turrets on their large line ships until Battle Cruisers. 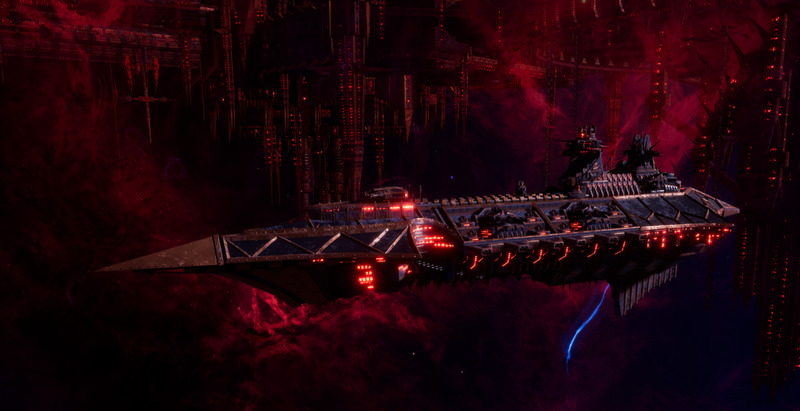 Of the Chaos Cruisers, the Murder is a little frustrating because it is the only Cruiser that can't focus all of it's weapon systems on a single target at once, with it's prow mounted lance having the limited 90 degree arc that keeps it from overlapping with the Macros. 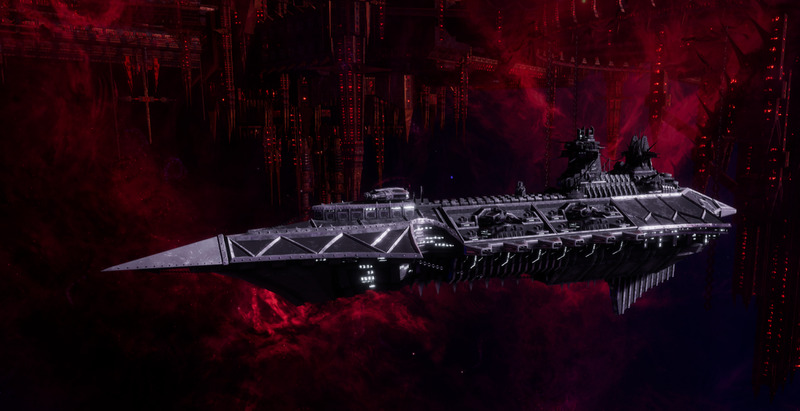 This isn't a nail in the coffin of the Murder's usefulness by any means, as this is something you have to deal with other ships in other factions, it just serves as a drawback when compared of other ships of it's class. If you really need lances, I would recommend the Devastation, since it does the same lance damage and crits out of each of it's broadsides simultaneously, while bringing squadrons and two wide arc turrets that can supplement the lances, even if their lack of armor penetration means they're losing most of their damage. 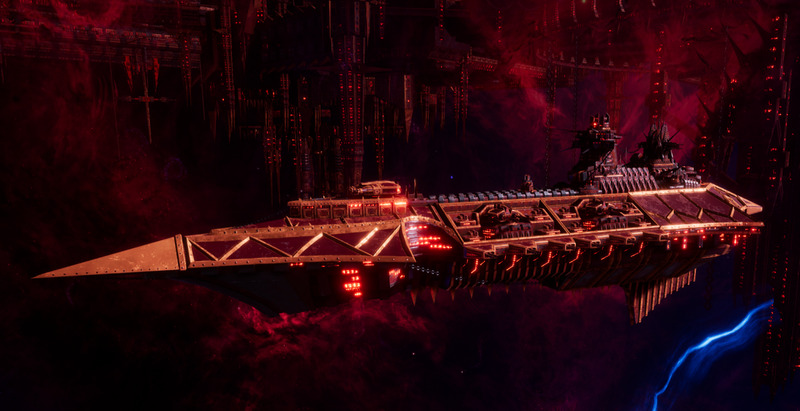 You can also try the Slaughter with it's merged Macro/Lance Batteries but you're rolling the dice a bit since it's difficult to tell how much damage is coming from the lances vs the macros with that ship (see above). 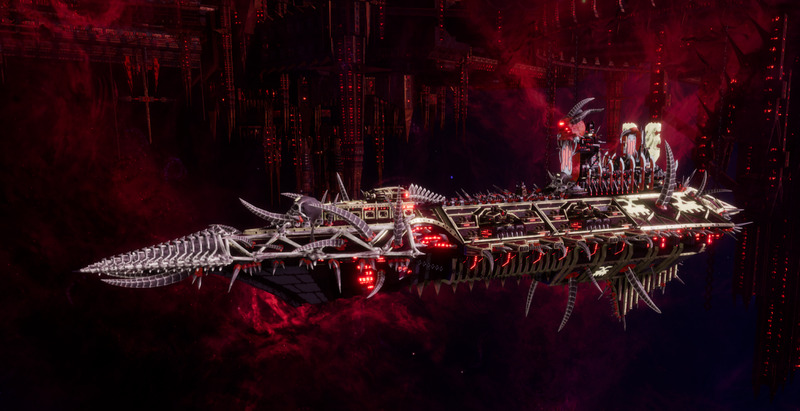 The main benefit to taking the Murder that I can point out, is that it comes close to the Carnage's damage output, ties it's crit ouput and brings at least some lances whereas the Slaughter has none, and the lack of wide arc turrets reduces the cost of the Murder to the cheapest price point of 173, though it's only 5 points cheaper than a possibly better Slaughter. 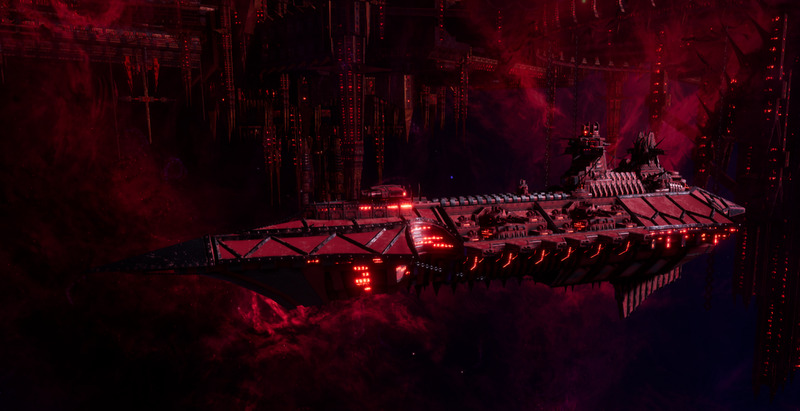 Without being able to calculate the Slaughter's lance to macro proportions as has been mentioned a few times already in the article, the Devastation takes the spot for your "lances plz" Cruiser while also bringing launch bays for squadrons, which if you aren't aware, Bombers can penetrate armor with their attacks too, complimenting your lances as long as you can get another carrier to deploy interceptors or otherwise find a way of guaranteeing their safety to their target. 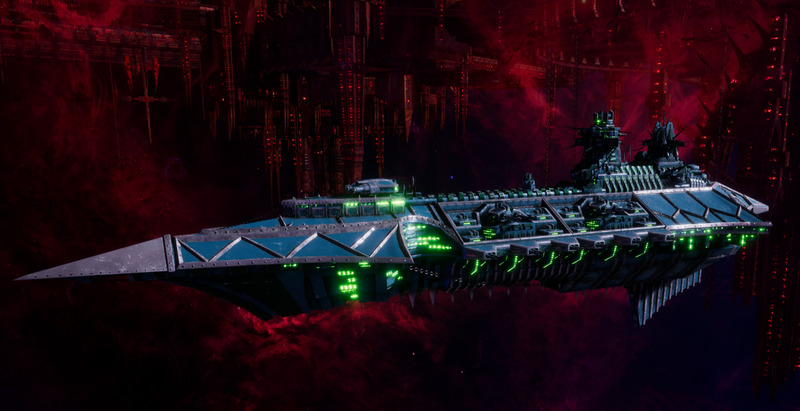 Without the benefit of reload orders affecting your lances, keep this ship in lock on orders to give its macros greater range so it can engage with it's full compliment at 13,500. Reload does not buff reload rate on lances, something worth noting as Chaos field alot of the dps in lance fire. 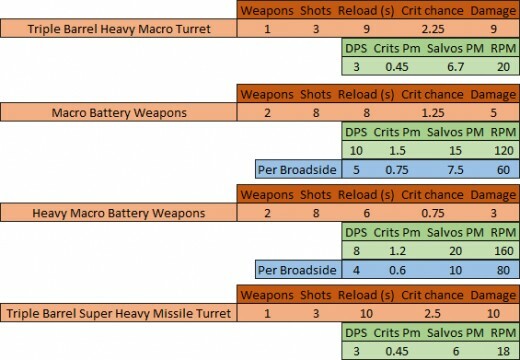 The merged batteries at least in the first game (and testing against a static target) means fielding 1 macro battery and 1 lance battery per side, this should mean 1 lance and 3 macro per battery.